Deepen your sense of the past at sights like Walker Sisters' Cabin and Little Greenbrier School. 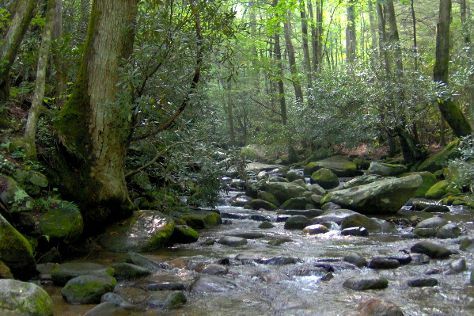 Step out of the city life by going to Mount LeConte and Roaring Fork. Get out of town with these interesting Gatlinburg side-trips: Great Smoky Mountains National Park (Cades Cove & Roaring Fork Motor Nature Trail) and River Rafting & Tubing (in Hartford). Next up on the itinerary: get to know the fascinating history of Noah Bud Ogle Cabin, kick your exploration up a notch at some of the top local zipline courses and adventure parks, take a memorable drive along Little River Road, and take in the dramatic scenery at Cataract Falls. For maps, reviews, ratings, and more tourist information, go to the Gatlinburg sightseeing planning app . Grand Rapids to Gatlinburg is an approximately 6.5-hour combination of flight and taxi. You can also do a combination of flight and car; or drive. Traveling from Grand Rapids in April, things will get somewhat warmer in Gatlinburg: highs are around 72°F and lows about 49°F. Finish up your sightseeing early on the 5th (Sun) so you can travel back home.